We know, the house is never really finished but I'm calling this job done. 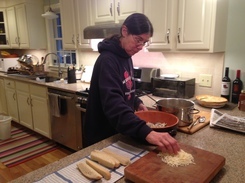 Mama making a yummy dinner for guests, Zachary and Tabitha. 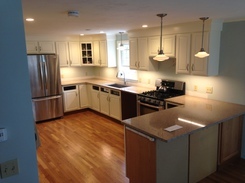 Wednesday, the 3rd, the counter top guys arrived and installed the new counter top. 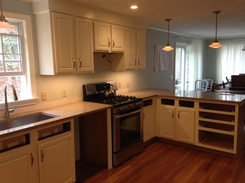 It is a Silestone thing manufactured and installed by Stone Work of New England. While we are away doing some family visits, our contractor, Chris Hutton, will be in to finish the tile work for the back splash and do some other tweaking. 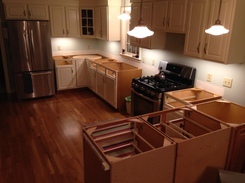 The kitchen may be complete by Christmas! 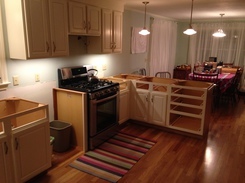 2 December 2014: Out with the old counter top and.... tomorrow, in with the new counter top. Plan A. One has a suspicion that Plan A is the plan we full fill. Chris and Tom arrived late in the day to unscrew and lift the old formica counter top off and remove it to the basement. Kevin the plumber disconnected the sink earlier in the day. Sure, we can do all that stuff and when the building inspector shows up, what do we say about that? They are really nice guys and do the work so well and are adding value in so many ways that are "extra." I always like these two images. 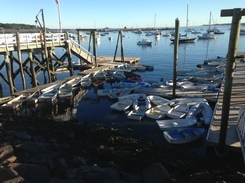 Kittery, Maine a few years ago. 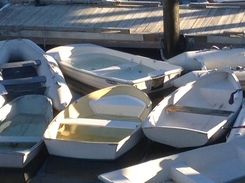 Clusters of dinghies amuse me. Notice that there are no oars.